Translations open with Adobe Acrobat Reader. within the first 2 weeks for those children of attendance for children who have not been identified as limited English proficient prior to the beginning of the school year. Due to the variation of geographic areas in which Traditional and Simplified Chinese are employed as the written form of communication, we are providing the Parent Notification Letter in both formats. Please ascertain the needs of the individual families and provide the appropriate translation. 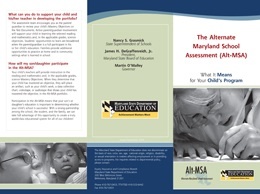 The questions and answers on this publication explain the testing program and how it affects your child. If you don’t find the answers to your questions here, ask your child’s teacher or principal for help. An annual program to honor Maryland parents who have made outstanding contributions to public education. 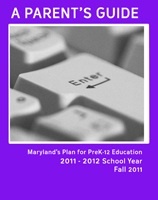 Leadership Succession Planning Guide for Maryland Schools (2006) - This innovative guide is a unique look at leadership succession issues in the public school sector, particularly the shortage of quality principals. It provides a stimulus for conversation for senior leadership in school systems, an outline for those educators interested in preparing their own leadership succession plan, and an actual leadership succession plan for an example school system. Translations of the Alt-MSA 2006 Parent Brochure into the top 5 non-English languages in Maryland: Spanish, French, Chinese, Korean, and Vietnamese. Maryland Instructional Leadership Framework (2005) - This document serves as the philosophical basis for the work of the Division for Leadership Development. It defines instructional leadership through eight outcomes and provides evidences in practice that should be evident where such leadership exists.